I have attended a NZQA best practice workshop today with a generic focus on how we can collect evidence that supports 'natural evidence' of student learning as well as supporting cross-curricular/integrated learning that means students gain the maximum number of credits for their learning, where it authentically matches: allowing student learning to go deeper by 'double-dipping' rather than over-assessing where students are being assessed multiple times for very similar learning content/contexts. It has been a very affirming experience that HPSS is on the right track - a track that is strongly supported by NZQA. It has also reminded me of the blockades that teachers themselves, departments and schools are maintaining as resistance to change, and instead of asking "how might we?" (thanks @maurieabraham ), there are still strong arguments that shut down opportunity for student-centred assessment by sticking with low-trust models of assessment that let authenticity worries drive the assessment design overall. 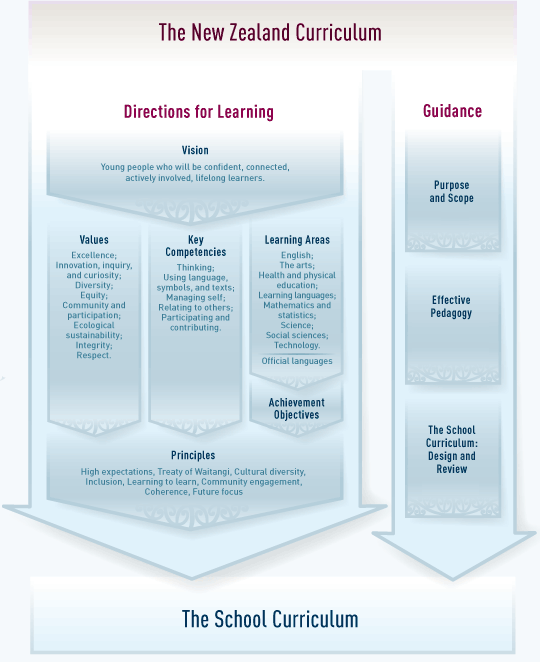 How do we assess for flexibility, innovation and student focus, while still retaining rigour and manageability? How to provide multiple opportunities to different students for the same AS, while still being manageable from a teaching point of view? How can we support students to choose their own mode of assessment? How to find rigorous assessment opportunities that authentically support more than one learning area? Not everything will mash-up in an authentic way - there needs to be rigour and a non-forced match between achievement standards. there still needs to be rigour via rubric and captured evidence that occurs during project/module and not one assessment event at the end. evidence cannot be retrospective - it must be purposeful and captured at the time of the event, we need to be able to authenticate the learning that took place at the time of the event. this allows us to have the ability to assess process of learning, not just the end product - this can help towards numeracy and literacy. this means that achievement standards can “fall out of” work done during projects. So overall, a really positive view that HPSS is on the right track and that we can definitely find ways to let the learning drive the assessment as we get into years 11 and beyond, and not the other way around. 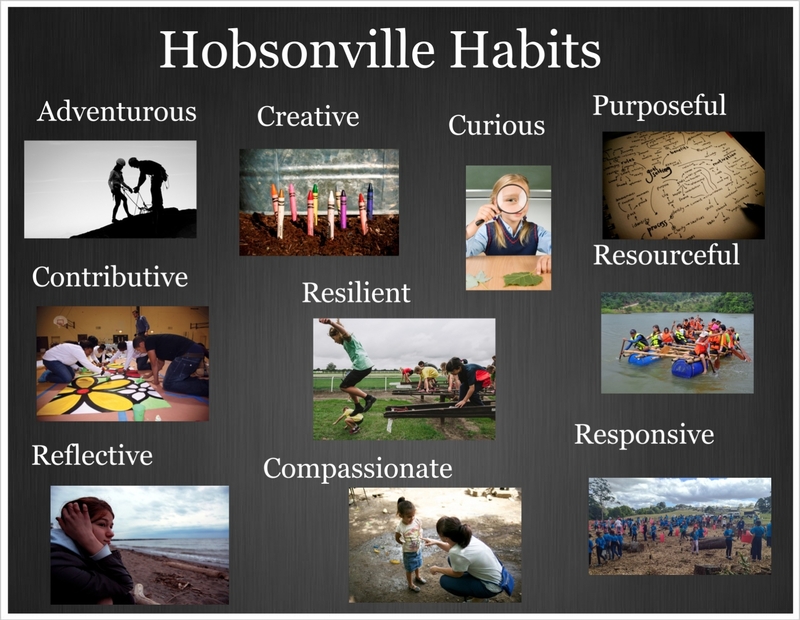 So Term 3 is rapidly coming to a close, and it feels like the right time to reflect on some of the lessons learned this first term for me at Hobsonville Point Secondary School. I came here mid-year, leaving behind some really wonderful colleagues and students (who I still miss quite a bit! ), knowing that HPSS did things differently, and feeling really excited about trying new ways of doing things & being able to learn professionally from a whole heap of amazing educators. It hasn't been as overwhelming as I thought it might be - partly because I had been following the happenings and progress at HPSS through friends and through blogs like Steve's, Claire's, Danielle's and Maurie's (to name but a few - how cool that so many HPSS teachers are documenting their journeys in this way!) - so I had a reasonable idea about how things were structured, although obviously not a complete understanding of everything. Most of all, I have learned so much from other learning area teachers, have been blown away by some of the work students have produced, and have had the opportunity to re-assess what the really vital parts of the science curriculum are. I have taught on two combined modules - a Big Learning Module (BLM - three combined learning areas: English, Social Science and Science), and a Small Learning Module (SLM - two combined learning areas: Design - Visual Communication and Science). I have also taken an Active Recreation Module (AR - yoga). By teaching combined learning areas, I have picked up on many strategies, techniques and approaches that I usually wouldn't have exposure to - one of the best is from English (and is actually a school-wide effort) in using PEEL paragraphs (Point, Explanation, Example, Link) to present ideas. Without recognising it, I had already seen this structure as an essential part of writing science answers in NCEA, and so by teaching this explicitly from early on, skills developed now will be incredibly useful later on. I have also learned that in order to make the most of the time I have with the students that I need to teach less better - so focusing on the vital aspects of each part of the science curriculum - this term has had a Nature of Science - participating & contributing emphasis - namely lending itself to socio-scientific issues. The skills involved in being able to deeply understand an issue have included exploring different perspectives (political, De Bono's hats, Kaplans tools, individual), the difference between an opinion and evidence-based conclusions, being able to identify reliable and accurate sources of information (CRAP detection), and science research skills generally. One of the most exciting parts of interdisciplinary research and of art-science collaborations is the questions that smart and curious people ask when they’re encountering a new field, the things that stick out when viewed from a different perspective. These kinds of questions might sometimes seem naive or even arrogant, but at their best they can point towards new directions where no one knows the answer and everyone ends up seeing something differently. Feynman’s great talent was to show us the universe–and the wonder and tedium of life in the biology lab–through a physicist’s eyes. I co-incidentally read this as I was starting to reflect on what I have learned this term, and the sentiment of learning with 'new eyes' seems very apt - it also ties into the very name of my blog - teaching with a beginner's mind - and the idea that only through questioning what is often status quo can we view things with a different perspective that can often provide a new pathway. I have learned too that missing senior students means that sometimes you get a bit over-excited, and want to do too much with students who think & talk like senior students (really great thinking skills) - but don't yet have the content knowledge or dispositions of senior students (as you would totally expect for year 9's!) - and so sometimes I have verged into overstimulation territory by trying to do too much at once rather than focus on what is really important. I know from what other HPSS teachers tell me that this is par for the course in my first term, and second and third time around you get a clearer understanding of what the focus needs to be. This is the aspect I have found has had the the largest learning curve for me. It is certainly like a tutor group/form class on steroids, and I really value the relationships that I am developing with my small group of students. I won't say it hasn't been challenging however, as the relationships I am forming are similar to those you normally have with more senior students - year 12 or 13, and ones that naturally form over 4-5 years of knowing those students - an organic process. To develop a coach/mentor/daily support role with my year 9 students in just 10 weeks has certainly not been the easiest process, but I feel that we have come along leaps and bounds already and I appreciate it when my students have commented how surprised they feel that I have only been there 10 weeks, as it seems much longer to them. The fact that I know what things I want to try differently next term shows me how much I've learned already. So overall, I'm loving the new experiences and while (like all teachers!) I welcome the holiday over the next two weeks, I have a plethora of new ideas and plans to try next term. More than anything, I'm very grateful to all of the HPSS team that have welcomed me so warmly, and to the students who have re-defined to me what being a year 9 is all about. One of the incredible opportunities of teaching in a cross-curricular, modular-based format at HPSS is that there is the chance to approach everything the students learn with real purpose. Focusing on doing less, better; emphasising a deep skill base in these early secondary years, rather than rote-learning facts that google could have showed them (NB: I am not saying that there is no need for content teaching - especially in science as there are many misconceptions to avoid - however I deeply believe that skills are an immensely valuable part of science, too often skipped over. See here for an earlier post on this). So over the last couple of weeks, in my Small Module (Transport Us - a combo of science & design-visual communication that I'm teaching alongside the fab Liz - in which students explore things like designing their own vehicle, being informed by the science of fuel sources, using evidence to form opinions and make decisions) I had the chance to incorporate some physics into the module. Initially I wanted to 'do' a friction experiment with them, because I could see how relevant the links would be between friction and their vehicle design, but the idea and planning never sat well with me, and as the time approached (incidentally also the day HPSS had 300 educators join us for the #edchatnz conference), I decided to ditch the lesson plan in favour of a more deep & robust (but slower) option - exploring forces first, then giving students the choice of which force they wanted to look into further. ... It was a very challenging lesson though - to ask these year 9 students to come up with their own question/aim, decide on variables and write a method from scratch - they found it hard, and to be honest the lesson didn't have that 'feel good' factor that you sometimes get. I came away to lunch feeling a bit disheartened that they had found the task so hard, and it hadn't felt satisfying. The wonderful Lea @leavellenoweth pointed out that she had also been placing emphasis on the importance of planning before the 'fun stuff' in her English module about developing passion projects, and also reminded me that the feeling of being uncomfortable and outside of your comfort zone means that you are learning! I went back after lunch and pointed this out to students, also letting them know that usually at a Year 9 level, it would be far more common for them to be given a method to follow - recipe-like - and to not have to devise the whole thing by themselves. However, as I wrote about in this earlier post about method-writing - I strongly believe that we have to stop giving students pre-formed instructions, and just let them figure it out for themselves when the stakes are not high. It is too late to leave this skill-development until Y11 or Y12 when NCEA comes into play, and the stresses of getting things right are much higher. My plan is to give them some feedforward on their methods before our next lesson, and then get them to carry out these experiments, making notes where their methods weren't detailed or accurate enough, and then re-write, and give to another student to see what the peer-feedback is, whether someone else could follow their method. "what skills & approaches that you developed during your career as a researcher were transferrable to teaching?" At the time (after feeling stumped and saying what a good question it was!) I replied that to be honest, I couldn't think of many that were that transferrable, mostly because as a researcher you have to be very self-confident with quite a large ego - after all, it is your belief in your own work that drives the experiments that you do (or ask others to do) - it is this belief in yourself that leads to grants being applied for, connections made to other research groups' work and the ability to get through the daily slog of many experiments not working, data not quite matching, until you occasionally get those incredible break-through moments. Whereas in teaching, there is no place for ego, no place to believe that you are more important than the students in your classroom - after all, the students are the whole reason you are there, and they must take priority over how great you may think you are. Critical thinking: Secondary school in my day was truly about rote learning and being right or wrong, and the critical thinking skills that I appreciate now, I certainly didn't develop until postgraduate study. Problem-solving: I pride myself in having a 'number-8-wire' approach to tacking problems, and through having to solve my own practical/experimental setup issues myself, I know how to think laterally around a problem. So all up, becoming a teacher has resulted in the loss of the 'luxury' of being able to focus so deeply on one specific area of cutting-edge knowledge and understanding (although it certainly didn't feel like a luxury at the time - in fact I still feel being a researcher is an incredibly tough career choice, especially for women.... but that's another post! ), the main thing I have lost in becoming a teacher is my ego.... something that drives research but can't drive a classroom. postscript: I want to clarify that ego in research really is necessary, otherwise nothing would get done, no-one would have the confidence to believe that their research could make the difference and to continue despite setbacks. 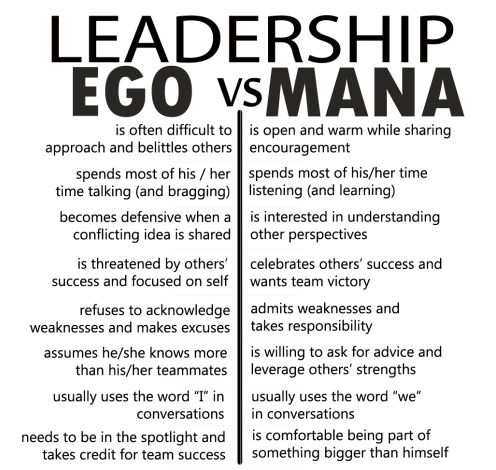 This isn't to say that every researcher is an ego-maniac, simply that the very process of being so closely focused on one small area of work (for which you may be the only person on the planet who is looking into that particular area of interest) leads to (necessary) ego forming. However our major challenge will not be continuing to encourage the converted to whom we mostly preach to, or those who encourage and support us with the confines of our conference, meet ups and online echo chambers. It will be the challenge of engaging the others - the unaware, the disinterested, the disheartened and even the 'happy oblivious' who have been lulled into a false sense of security brought on by good or even great National Standard and/or NCEA attainment. so I guess the challenge becomes how can we convince all teachers to keep moving forward and questioning their own practice? My prior strategy of enthusiasm & stealth is now no longer required at HPSS, where everyone is up for discussion about everything that gets done.... so time for a more active approach to reach out to others? (And I'm in no way suggesting I'm an expert at anything, but I hope my enthusiasm & willingness to delve deeper into my teaching practice to find a more student-centred approach might help convince someone else to do the same). First week at @HPSSchool completed! To sum up in 4 words: supported, responsive, authentic, connected :) kids blew me away with enthusiasm! #hackyrclass week 5 - blended learning/mix-it-up! So this is the first week of the #hackyrclass challenge that I've finally felt vaguely in my element. Blended learning is my modus operandi for the most part, because I truly believe in giving students options as to how they learn, and this includes providing learning opportunities and experiences from all modalities, be they e-tools, hands-on activities and practical experiments, planning collaboratively, writing their own answers on paper, playing games etc etc. I am fortunate that I currently teach in a 1:1 laptop environment, and so this means all students have a degree of e-literacy and there are no excuses about not having access (although a 1:1 environment also raises the dilemma of using technology for technology's sake - something that is a completely backwards way of looking at learning in my opinion... the technology should be there to facilitate and deepen learning, and never be the focus in itself). I use a wide range of e-tools in my classes, including google docs for collaborative work, google forms for effective feedback, edmodo to facilitate student voice, participation and collaboration, flipping the learning (as described in this earlier post and my youtube channel) and lately I've been playing around with making weebly's to make sites that my students can use to self-direct their learning - taking ownership of their learning path. The most recent attempt is here: (and this also complements resources available on our Moodle pages) - this is currently the work for 5 lessons/a week. It has a mix of activities to complete, including written answers on paper & activities like making fossils, but I also assess their learning through edmodo quizzes, which means I can get a quick grasp on how they are going. Class time is now 'freed' up for me to check in with & help students individually, they can work at their own pace - including outside of class time, and if they ask me to, I can still do a lecture-type summary to give them confidence they are doing ok. I also set them deadlines - giving them targets in which they need to have completed so many sections. This is also great at the moment because I have lost half my class to a 2-day field trip, so it means the students away can easily see what they have missed and how to catch up (we also have a google doc running with student key questions for each section of learning), and I won't end up having to teach the same thing twice! If anyone would like the 'passport' doc or further info, just let me know - happy to share! So in 'real science land' experiments are always full of purpose, and sometimes more time goes into planning them than actually carrying out the experiment. I noticed recently (in the lead-up to a practical internal) that my Year 11 students struggled with writing methods by themselves, in particular writing logical, procedural, detailed methods that another student could follow, to carry out a reliable and accurate experiment. This took quite a bit of intensive feedforward to help everyone up to speed, but we got there in the end! My gut feeling was that this was at least in part due to lack of practice in this area - I worry that in the haste to cover more content, we give our students pre-made (or even semi-guided) methods to use, and while this aids us in 'covering' the material in a faster time, it isn't helping the students develop the ability and skill to design, develop and write their own methods ('uncovering' if you will!). At the start, I gave them only a list of equipment and reagents/materials available for them, reminded them briefly about fair testing, and let them go. I provided no help whatsoever in the planning - questions about what volumes to use, how long to mix etc went unanswered by me - I just asked them to use their best guess, and then we would see what happened. Rose-Bud-Thorn - Thanks to @GeoMouldey who prompted me to look into the Rose-Bud-Thorn method of analysing work. (Very briefly - rose: good things; bud: things to develop; thorn: anything that didn't work). Helpful, specific, kind - see this link for more detail (which also links in to 'Austin's butterfly' - which I will mention later!) This is a way of peers proving feedback/forward that is actually useful and not harsh to read - no generic comments of "very good", or "this was awful!" - students have to give feedback in a way that the recipient can act on it, and they also feel empowered by the comments not belittled. I took the rose/bud/thorn categories of feedback/forward, and combined it with "helpful, specific, kind" and asked the students to provide at least one comment under each category for the other group's method. After they had swapped feedback, I had each group volunteer the 'buds' from their own feedback, and we wrote them all up on the board. Amazingly (or maybe not! ), the 'buds' they came up with were the main issues I had been having with my Year 11 students, which goes to confirm that hopefully doing more practicals like this can help to set students up with the right skills before they get to NCEA. Lastly, I showed the class the Austin's butterfly video (see earlier link) - to reinforce that very rarely do any of us go from start to great in one go; we all need chances to improve and refine. Last thing in this very long post! 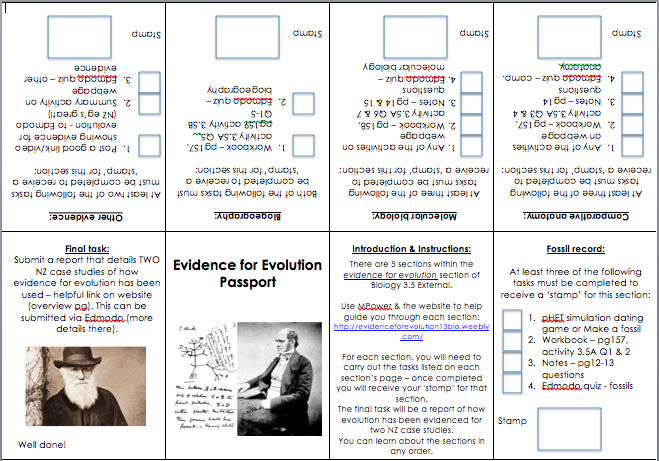 Next week, as part of the level 3 Evolution & Speciation External, I have set up a student-directed week-long 'chunk' of work around evidence for evolution, and I'm including as many practical things I can get my hands on, like making fossils (I am pretty sure that even year 13's love playing with play-dough and plaster of paris! 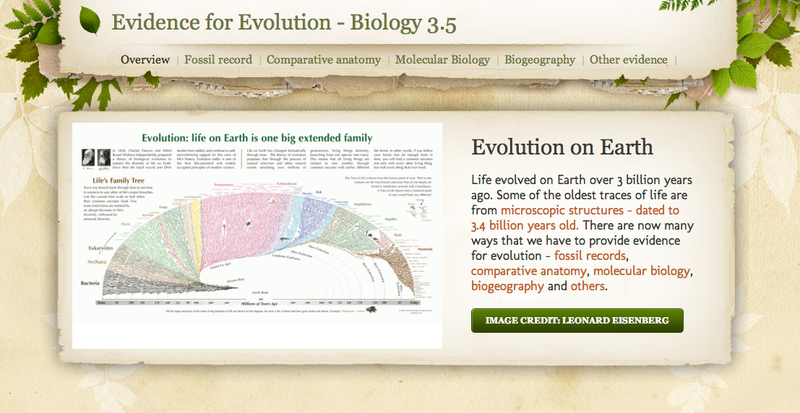 ), and using lollies and/or beads to demonstrate other aspects of evolution wherever I can. The challenge for this week is design thinking and I will be the first to admit I'm struggling to find ways to get a really good grip on it! While the general ideas underpinning the philosophy ring true for me, including the processes it involves, and I can see it as a whole approach for learning, I think it's going to take me more than a week to implement! So what are my thoughts on it? My late father was an architect, an industrial designer (we used to call his profession a 'dusty shiner' as children! ), and also a tertiary educator of design students at Unitec and AUT over the years. Whenever I remember him talking about his designs, including the spatial design course he ran, his emphasis was always on people - how would people use the space? How would they feel within the space? out of the space? What purposes and functions could the space adapt to? All his design ideas came back to people at the heart of it. 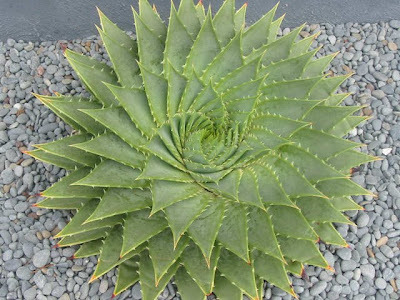 He was also obsessed with mathematical concepts like the 'golden ratio' and Fibonacci numbers - but not in the mathematical ideas themselves, but rather how these numbers and ratios made people feel more comfortable in spaces. He was a very quiet and gentle man, and a very deep thinker. Everything was well-thought through and meaningful, if always extensively late and beyond due dates! But I am now realising how important it is to approach things, like teaching, with purpose and to accept that it will take time to develop ideas and pedagogies properly. The first time I try things, they may not be completely successful, and will probably need tweaking (with students providing the feedforward as to how to improve). My own lesson in this: I tried to remember every lesson of design and architecture from my Dad when I drew up plans for our own house building last year. I kept us as a family in mind - what spaces did we need? how would we use them? what technically had to be located close by? how would we feel in the spaces? The final plans were very close to what I started us off with, but many iterations were needed to get there - tweaking and adjusting and sometimes going back to previous versions when 'brilliant' ideas didn't work out. It took much longer than we expected just to get final plans done - but now living in the house there is barely anything we would change. So, how do I apply this to teaching? I know I need to give my current students more room to 'prototype' - they are very set in aiming for 'perfect' and 'right', and have been spoon-fed so much (not by me, but as a general rule to a certain degree! ), they don't have well-developed skills in drafting & developing ideas. I want them to know that the process of truly developing ideas and answers can be scary and at times you're not sure that you're going in a forward direction, but that you can end up in a much more satisfying place than model answers can provide. (and this doesn't mean that there are no wrong answers - in science there certainly are wrong answers, just like in house building.... no, you cannot move that room there!... but maybe it is better for students to find their own way there). Regardless, I am going to continue my learning about design thinking as it feels natural and genuine.... any advice welcome! It has been a very busy week here, so I have not been able to put as much energy into the #hackyrclass theme for this week as I would have wanted, however I thought I'd comment on a couple of things I have previously done to get to know my learners better. One thing I have done this term within tutor group is to get each person in our group to share something with the rest of the group, be it bizarre skill or a hobby they enjoy. I've kept to the theme of sharing 'random' things, as many students within our tutor group are introverts and not very confident in sharing things about themselves. I started us off by sharing something that is important to me - I'm a bit of a hippy and into yoga & meditation, and wanted to share something that might be able to help with the stress bunnies that are my students, leading up to exam/internal assessment week (that starts this week!). Another thing I found last year (I won't call it a strategy because I never intended it as one, it was simply something that happened organically through conversation) - was that when I shared something about myself to my classes, this greatly strengthened the relationship we had. 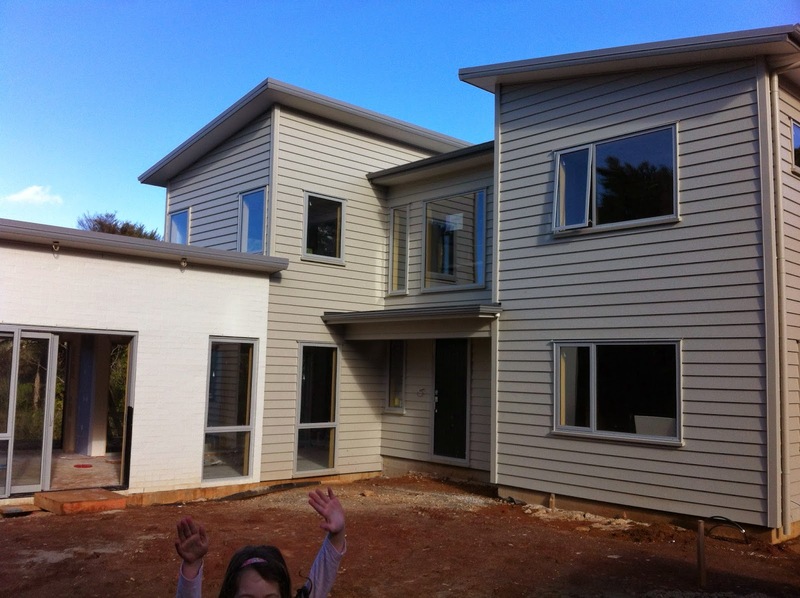 My example is that we built a house last year, which was (as you would expect!) a long drawn-out and sometimes stressful process. Each weekend we would visit the construction site, and photograph how the progress was going, and in the following week, I would share a photo with a couple of my senior classes. It became a way for students to connect with my story, offer their own experiences, and I found I was always being asked how my house was going, even in the corridor in passing. My students were genuinely interested too, and were excited for me when we finally moved in! This year, I have inherited about 1/2 my students again in one particular class, and at the start of the year it was one of the first conversations to come up. ...to this in about 9 months. So while this isn't specifically about getting to know your learners, it is about 'building' ;) relationships with them - and for me, it is through things like this that I do get to know them really well. I've found if I'm willing to open up and share aspects of my life (not everything obviously! ), then they tend to open up and help build strong, positive learning relationships. The first week of term and more excitingly, the first week of the #hackyrclass movement (yes, it is a movement! In fact I'm calling it the #hackyrclass revolution ;) ) has passed, and I'm certainly back into the swing of things. We have 8 teaching days left before assessment week (exams, internal assessments), and so the pressure is on to make every lesson count. A completely bizarre time to try out new things, you say? Not in my mind - because everything I'm doing is trying to maximise my students' learning opportunities, and I'm trying to get them to make the most of the 'contact' learning time we have together (because I know they are also learning outside of class - grateful for YouTube view tracker plus Moodle logs!). This week being growth mindset focused (see Claire Amos' blog), my aim was to get my students embracing the challenge of taking charge of their own learning journeys. I also sought feedback on both how students approached their learning, and how they felt about the learning approaches we had tried this week. 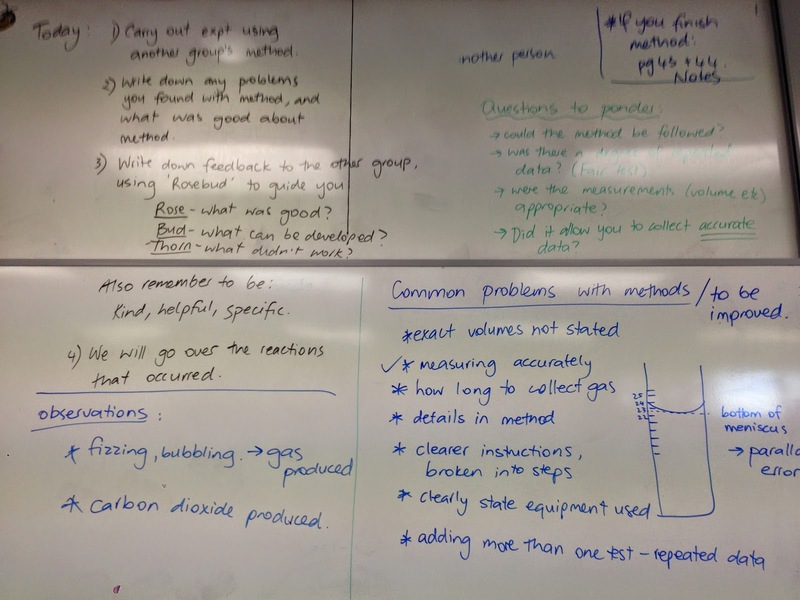 Let students make mistakes: we are prepping for a L1 science practical internal, which is rather a big deal for our students (kinda scary for them to design an experiment, carry it out, collect data, analyse data, write a method, discussion and evaluation all in a set time frame, all by themselves). But I know that students (and me!) learn best by doing, not being told, and I include making mistakes in this. Several times I caught students using methods that I know are not reliable or accurate but instead of telling them how to improve then and there, I let them collect their data and see what discrepant results they had. This meant we could then have a discussion about what went wrong, and they were able to problem solve and correct the issue. Had I just told them to use the exact same equipment for repeats (for example), they wouldn't have really seen why that was so necessary. 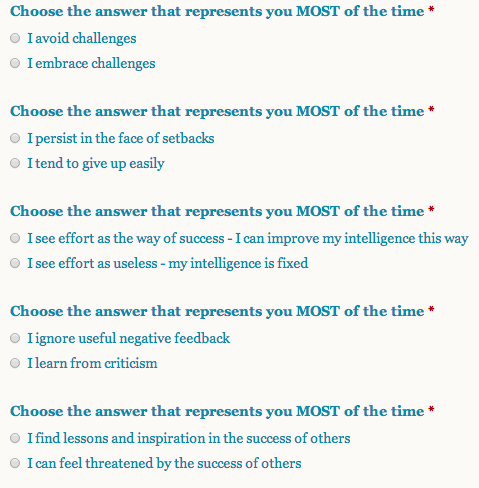 Interestingly, all students responded that they knew they were capable of improving their intelligence through effort. The other questions were more mixed, with the juniors especially responding that they often saw other's success as threatening. I did notice that individual students responding that they avoided challenges, gave up easily or ignored useful negative feedback were my students who tend to struggle a bit more with their learning - something to follow up on and see what I can do to change their mindset! The videos were reasonably intense (the Biology they learn in Y13 is full-on, stuff I didn't learn until 2nd-3rd year physiology! ), and so I had my doubts as to how good their retention would be..... but as soon as I asked some introductory questions the next day, and they all enthusiastically responded with really good understanding (although that obviously still had to be unpacked), it blew me away. I continued to develop this throughout the week, and by the end of the week I had the students come up with their own learning objectives, and even more excitingly, categorise them using SOLO, so they could get an idea about which activities might help them the most. What could get more exciting than this, I hear you ask? Their feedback! I've just started collecting data, but so far it's looking good, and even better they have had some really helpful constructive criticism and suggested ways to improve the approach, including breaking the videos into smaller sections (something I had planned already), and even multiple suggestions of having a quiz at the end to test their knowledge (something I'll do with Edmodo). The media (and perhaps other teachers) don't give these learners enough credit: they know how they best learn, and give them a chance - they will tell you what they want. Other surprising results so far - I'm finding I have more 'free time' available, as I am doing incidental marking and feedback in class, and because I would have been prepping at night anyway, it's not taking up any more of my time. Work in progress? Definitely, and certainly things to improve upon and change as we go, but because the student feedback has been positive so far, we'll keep going down this road.... remembering that this is but one tool I can use - approaches to improve student ownership, not use technology for the sake of it! 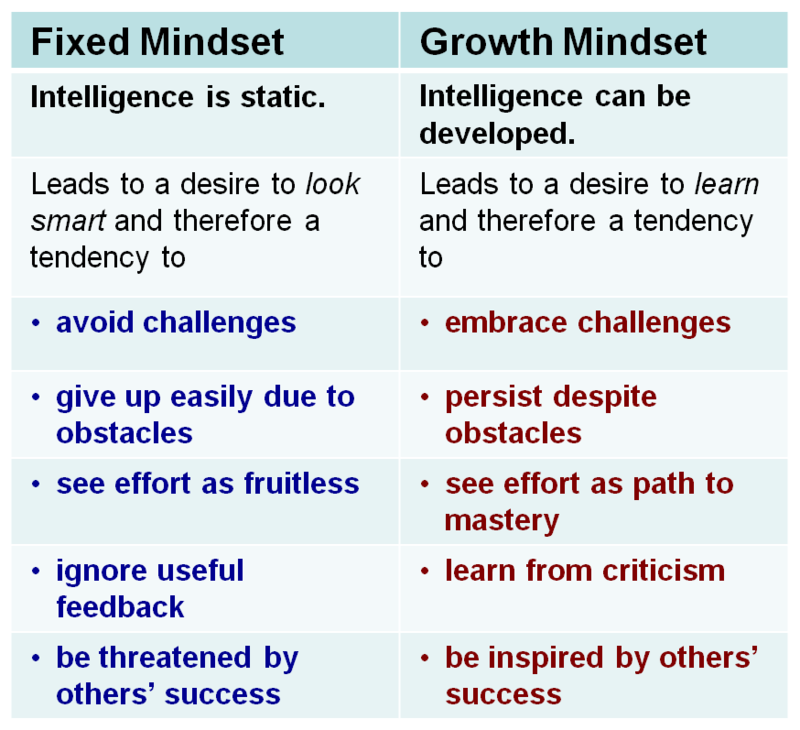 Another good read is: growth mindsets in maths and science - very interesting in particular to me, given my experience at a girls school - relating to the achievement of women in science and maths. So regardless of my background in growth mindsets, how do I invoke this change of understanding in my students? There is a big problem with many students set on getting the 'right' answers, and falling into "I don't get it" mode, without hesitation. So, what did I do today that emulated a growth mindset, and hopefully influenced my students through osmosis? Feedback on student work - I try and avoid giving grades where possible, but instead give lots of feedforward advice, how students can continue to improve upon their work. The wonderful Alfie Kohn's research supports this: the case against grades . Did my students initially complain? Maybe, but once I explained the rationale, they accepted it an moved on! Today, as well as giving written work back, I commented to the entire class how pleased I was that everyone had attempted all questions, there were no blank answers, and I could really see that they had put lots of effort into it. I see it as a win-win: I feel good for having positive, genuine interactions with my students, and they feel good for having made an effort, even though they may be able to make further improvements! I love this video - Austin's butterfly. Where would Austin be if his first butterfly had been awarded an Achieved grade? Would he have continued to develop it? Trying new things with relish - today I launched my own version of flipping my classroom in 2 of my classes (see previous blog post on this). Last term I found I was doing more transmission-style teaching than I was comfortable with, mostly due to the huge amount of tricky content to cover, and it made me feel dissatisfied and unhappy. I was open with my students at the time, and told them I wasn't happy with teaching that way, so today I explained that we were going to do things differently this term - but this was going to require a commitment on their part to fully participate in flipping the classroom, and (thankfully) they were excited and on board with the idea! I'm looking forward to 'pre-loading' the content before our lessons, and being able to facilitate genuine personalised learning in our precious class time. I explained I had taught myself how to use the 'explain everything' app over the holidays, and had created a new YouTube channel (which brought some laughs) - but it was important for them to see me being willing to learn new things without fear. Tomorrow will be the first lesson post-flip, so I'm excited to see what the students think. Challenging student conceptions - Today one of my (younger) students claimed she was waiting to write an answer down until it was perfect, until she had seen what everyone else thought the right answer was. I rail against perfection! Perfection is impossible, as I told her, and to aim for it is to be continuously disappointed. I asked her to take a chance and write down (in pen!) what she thought the answer was - it didn't matter if she got the answer not quite right (and in science there really are correct and incorrect answers) - it mattered only that she took a chance and trusted in her brain to come up with the correct answer. So, what are my next steps? My senior classes have internals coming up, so class time is at an absolute premium (hence the flipping idea), but I intend to have a discussion with my junior students about growth and fixed mindsets, especially because they are more inclined to see themselves as 'clever' or 'not clever'. I'm really interested to see what they think, and how recently being away at an intensive camp for a month (part of their school year) has influenced their mindsets.... more to follow! My last thought for today - what can I do better? Where do I fall down? Today I instructed some of my seniors in the 'rules' of how they can best include concepts in their upcoming internals - I hated doing it and wish that we had more time to allow them to explore their own ideas to come to similar conclusions. It's a rather prescriptive internal in terms of the ideas the students need to communicate, and also a practical internal, so our lessons have to concentrate on allowing students to design and carry out their own experiments, and perhaps even fail doing them, so that they can develop their technical skills...... so maybe not all bad, but my approach wasn't as open-minded as I would normally have preferred. So maybe something I need to develop - to trust both myself and my students that they are capable of coming to a deep understanding on their own.